In addition to creating standard discounts with Revel, you can also create specific discounts like Happy Hour Discounts. 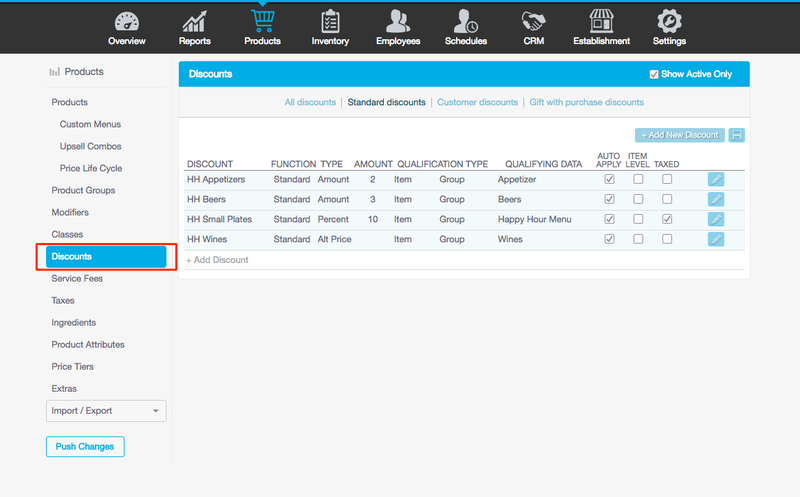 In the Management Console, navigate to the Products tab and click Discounts from the left side. Click the grey + Add New Discount text. Fill out the Discount Name and leave the Function as Standard. Choose Amount if you give a whole dollar amount off during Happy Hour, such as $2 off speciality cocktails. Choose Percent if you give a percentage off, such as 10% off house wine. Choose Reprice if you reprice specific items to the same dollar amount, such as all domestic beers offered for $3. Choose Alt Price if your Happy Hour items are repriced to various amounts. The alternative price must be set per each item in the Advanced Product Details. Fill out the Amount of the Happy Hour discount depending on your chosen Type. Select All if this discount can be applied at the product level or the order level. Select Item if this discount can only be applied to products. Select Order if the discount can only be applied to an entire order. If you chose Item or Order, select whether this discount is based on a Class, Group, Modifier Class, Modifier, or Product. Once selected, you can then choose which specific class, group, modifier, modifier class, or product the discount is based on. For example, if you offer all domestic beers for $3 during Happy Hour, you would first create a product group that contains all domestic beers and then choose the group in your discount. Check the Auto Apply box if you want the Happy Hour discount to apply automatically if the criteria is met. If you chose Order as the Qualification Type, check the Item Level box if you would like the discount amount to apply to every item on the order as opposed to the entire order subtotal. Check the Taxed box if your Happy Hour discount should be taxed. In the Discounts page, click the pencil icon to the far right of your Happy Hour discount. 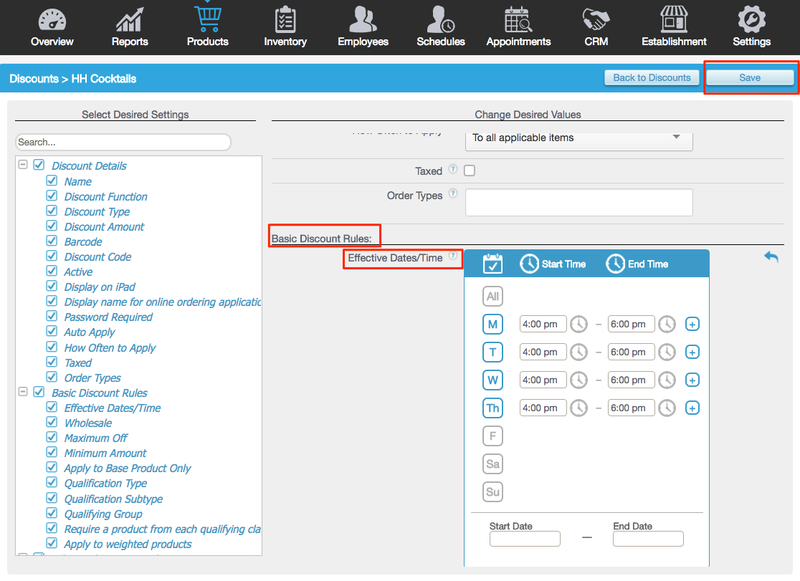 Enable any other advanced details, such as Maximum Off or Apply to Base Product Only, if needed. Click Save in the top right corner to save your changes.